OUR ESSENTIAL OILS WILL TAKE YOU ON A SOOTHING JOURNEY THAT REJUVENATES YOUR SENSES AND MAKE LIFE MORE BLISSFUL. AROMATHERAPY, HOUSEHOLD CLEANING, PERSONAL BEAUTY CARE OR NATURAL MEDICINE TREATMENTS, THE CHOICE IS YOURS. 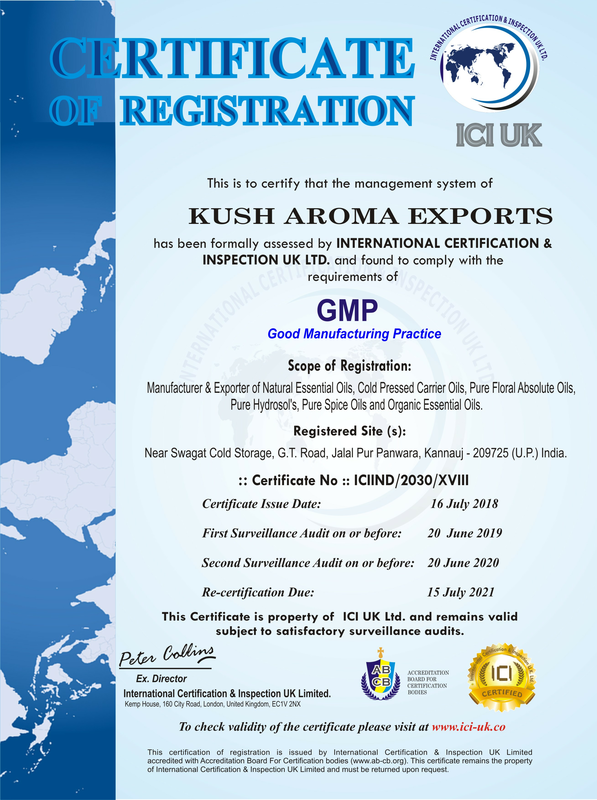 Kush Aroma Exports was founded in 1962 as the trusted natural essential oils manufacturer, exporter, supplier and wholesaler. We adopted the natural essential oils field to keep the ancient philosophy alive of making a balance among body, mind and soul. Our clear perception is to represent the nature’s 100% pure and finest range of products in front of the world. Kush Aroma Exports is the leading essential oils manufacturer you can choose to avail 100% pure and natural essential oils that are carefully extracted at well-equipped distillation plant in Kannauj, India. The range we provide is prepared from fresh picked flowers by following steam distillation method. We are renowned as the popular essential oils suppliers which also process an unadulterated range of cold pressed carrier oil, peppermint products, spice oils, traditional Indian attars, floral water and other allied products. 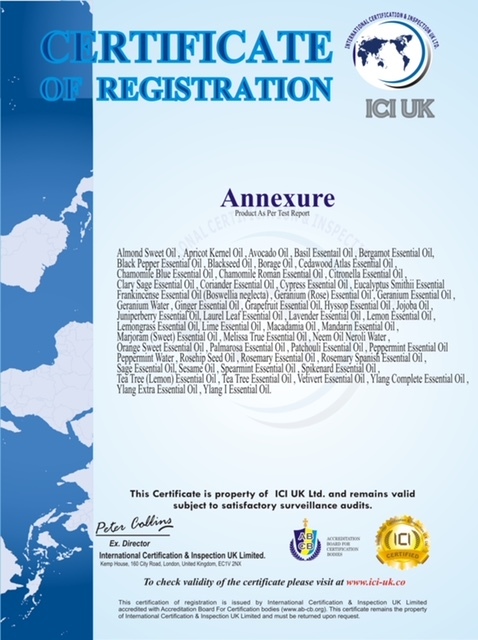 History Of Essential Oils In Kannauj Our region of manufacturing essential oil is Kannauj which is famous as the biggest perfume industry across the market. In Kannauj, you will find a great and systematic production of perfume, incense sticks, attar, rose water, and organic essential oils. There is a long history of essential oils in Kannauj as the Mughal Emperors were also interested in procuring natural extracts from here. If you are interested in buying essential oils from here, you made an absolutely right choice. Experience The Nature’s Source Of Health, Fitness And Longevity Aromatic oils or essential oils have been used by many cultures around the globe. These are the powerful extracts that have long been praised for their healing, beauty enhancing, spiritual, medicinal, therapeutic and aromatic attributes. At Kush Aroma Exports, you will be facilitated with the magical range of essential oils. We are the trustworthy manufacturer, supplier and exporter of natural extracts and stick to the philosophy to keep soul, body and mind alive. 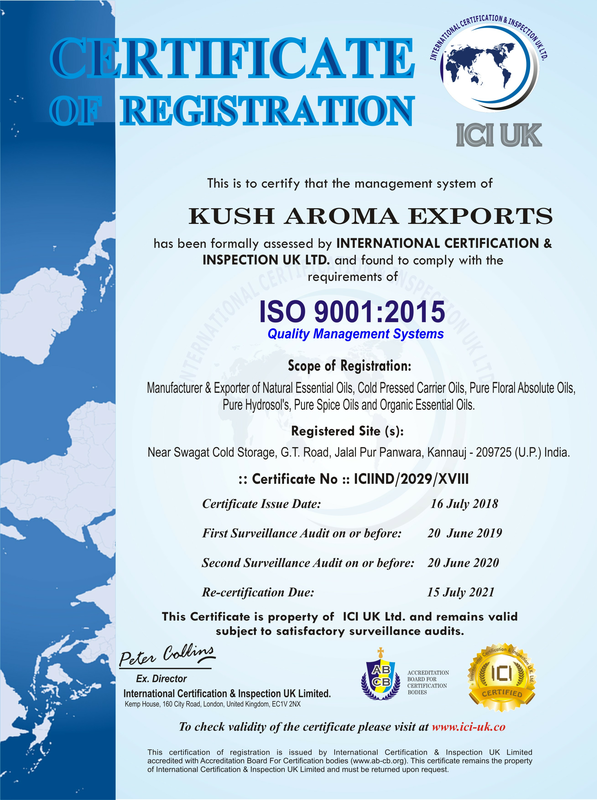 Avail Certified Quality Essential Oils Kush Aroma tops the list when it comes to evaluating the best essential oils manufacturers, suppliers and wholesalers in the market. Be it essential oils extraction, processing, packaging or delivery, we use proven methods to carry out each activity with finesse. You can count on us for having a magical essential oils assortment which is of supreme quality and not subject to any type of adulteration. Areas Of Essential Oils Applications Food & Beverage Industry, Medical Institutions, Spa & Relaxation Areas, Cosmetics Industry, Toiletries, Therapeutic Centers, Aromatherapy Centers, Perfume Industry Let’s Explore The World-wide Demand Of Essential Oils According to the proven stats - From the year 2010 to 2015, there were a drastic explode of customers using essential oils. By calculating the exact ratio, the global market demand of essential oils has been estimated approx 174 tons which is predicted to reach around 245 tons by the end of 2020. Our prime mission is to put strong footholds in the essential oils market. We do it by diversifying the portfolio with a true range of aroma oils. Being the best in the industry, we grab opportunities from all over the world. This is the reason; we touched the momentum with our successful reach to Japan, USA, Asia Pacific and South America. And, the list is expanding to attain more. Our enthusiasm leads us towards putting efforts for something which other brands think is not possible. We have a successful track record where we maintained a strong customer-base who repetitively purchase our products. Our offered oils range is completely pure and obtained from natural essentials. We maintain a cordial relationship with our clients and facilitate them with quick responses to their queries. Our order of essential oils was delivered on time with great care and it was beautifully wrapped in packets. The products quality was superior with a variety of range and price. 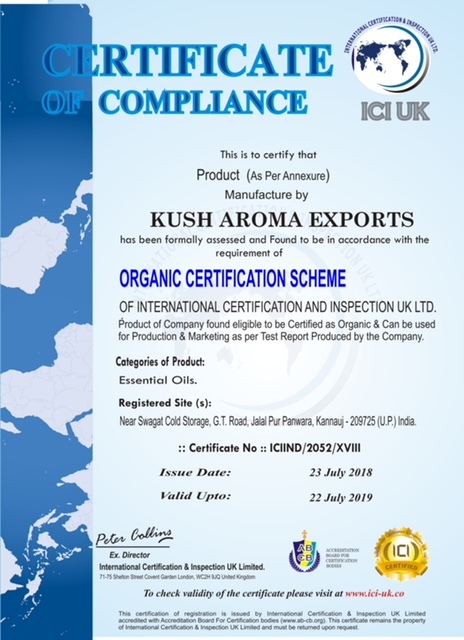 We extremely impressed with the level of service we have received from Kush Aroma Exports and we will continue to order from you and will be more happy to recommend you for anyone else. Best collections of organic oils I have purchased from Kush Aroma Exports. Actually I was just searching for the pure & natural organic products for aromatherapy. I was using different ordinary oils products for aromatherapy but, it was of no vain, but Kush Aroma Exports supplies best oils with best delivery speed. 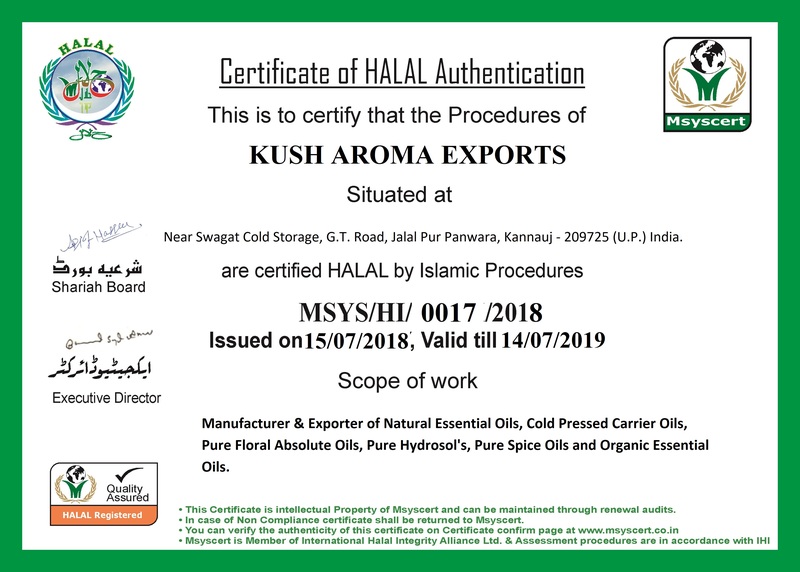 Kusharomaexports is a unique brand among the mix of essential oil agencies available on the market today. I love the quality & affordability of Kusharomaexports essential oils because they never compromising quality and testing protocols.